Here is a review of PT boat model kits: Large 1:32 and small 1:64 scale PT 109 from Lindberg, PT 596 from Italeri, 80ft Elco and 78ft Higgins plastic kits from Revell and more. Here is a rundown of PT boat model kits that I'm aware of. I've tried to limit it to those still in production or that come up for sale every once in a while on auction sites. Today, plastic is the most popular material for kits. Here is a list of popular PT boat kits. Italeri PT boat model kit 1:35 scale. This kit was issued only a few years ago and is of excellent quality. The PT 596 is a big kit and it's hard not to compare to the old 1:32 scale Lindberg PT 109. It's staggering to think both kits sold for about the same price only a few years ago. The Italeri is vastly superior in all respects, but has now gone out of production. It is by no means rare, but demand is starting to outpace supply, so the price is creeping upward. The kit includes a sheet of etched brass fittings and is probably the best plastic PT boat model kit to be made so far. Unlike the Lindberg, this kit was never intended to be motorized, much less equipped with RC. Even though this is a higher quality kit, I'd say it is more difficult to convert to RC. In fact, I'd advise against it. If you want an RC PT boat there are better alternatives. Italeri has released a set of crew figures as a separate kit. The quality of the figures is what we've come to expect from this company. Crew figures are a rare commodity in any event, so if you're looking for any crew at this scale, these may be easier to modify than many other railroad or military figures. The 1:32 Lindberg PT 109 is a classic in its own right. It was first released in the 1960's, and its age is showing – especially next to the new Italeri PT 596. It was still in production just a few years ago, so there are plenty available on the second-hand market. The scale details are crude, possibly even by 1960's standards. The kit comes with a set of crew figures that are, well, pretty rough. Lindberg PT boat model kit 1:32 scale. None the less, this is a desirable kit that can bring a wad of cash at ebay, especially unbuilt and in pristine condition. Having said that, if you are looking to buy a kit to build, you can find a bargain by waiting for either a kit that someone have already started or one with a damaged box or other small defect. This kit is motorized and it is big enough to take a 2-channel RC system. Unfortunately, the motor and running hardware are skimpy and pretty much useless. If you are serious about converting the kit to RC, be prepared to redesign the drive train. I converted a Lindberg PT 109 to RC many years ago. I ended up replacing the prop shafts to a single M4 x 250mm long Graupner shaft. The undersized motor that came with the kit was replaced with a Mabuchi 540 type motor. The original two rudders can make due, but are bordering on the flimsy side. A nice feature is the hull access is already all worked out with quarter turn latches. On a last note, watch your weight. A plastic model is a lot heavier for its size than a similar model made of wood or fiberglass. After installing the Mabuchi motor and a six cell nicad the model was slightly heavy on the waterline. In all, if you are looking for a quick and easy way to get an RC PT Boat, this is a decent option. If you on the other hand is looking to super-detail a static model, go with the Italeri kit. Another kit by Lindberg, and just as old, is the 1:64 scale version of the PT 109. This too is an old kit, at about the same detail level as its bigger brother. With the advent of LiPo batteries and lightweight radio gear, this kit could be converted to RC. Definitely a challenge, but could be done if care is taken to keeping the weight down. Revell/Monogram has a kit in 1:72 scale. This scale is popular with airplane, armor and military figures - so plenty of opportunity for diorama builders. As with both Linberg kits, this kit is showing its age - it made its first appearance in 1963. Having said that, this is a good kit for its age. With some effort you can end up with a very nice looking model. Revell PT boat model kit 1:72 scale. The kit has been released so many times its hard to keep track. It's been PT 167, PT 117, PT 190 and who knows what else. It has also been released under other brands such as the Hasegawa "Black Lagoon". This kit is a rebox of the Revell 1:72 scale PT boat model. It was marketed as the smuggler PT boat as it appeared in popular Japanese comics. They included additional resin parts that were unique to the anime and manga. Revell Higgins PT boat model kit 1:100 scale." The only main-stream plastic kit of a Higgins PT boat is by Revell. It has been released as PT 207 and PT 212 and maybe others. They seems to be confused about the scale, some issues say 1:96 others 1:100 scale. It's too bad they couldn't stick with the same scale as the 1:72 Elco boat. I know very little about this kit, but it looks like its been around a while. At 1:160 scale it is really small. Testor as a brand I'd say inhabits the mid to low end of the market. The 1:160 scale falls within the range of the popular N scale for model railroads. It may seem far fetched, but if you are building dioramas you may find vehicles, accessories and figures to convert from model railroad products. The 1:350 scale has emerged as the large standard size in modern plastic ship models. Long gone are the days of "box scale". That's how I see this kit, putting it to its best advantage is to let it enhance a larger model or other model collection. Its too small to do anything else on its own. The kit is in 1:48 scale and is designed by author and model builder Dr. Al Ross. The kit is well detailed and the only one I'm aware of at this scale. Bluejacket is a company that has been around more than 100 years with a solid reputation for their high quality kits. 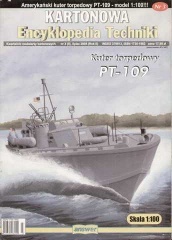 Answer paper PT boat model kit 1:100 scale." I have not seen this model in person, just letting you know it exists. I think motor torpedo boats and PT boats lend themselves well for the medium with their hard chine hulls. Here are some books that may be of interest for those looking to add detail or looking for paint schemes for your PT boat.